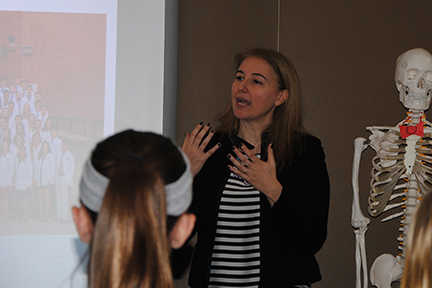 On Wed., March 2, 7th-grade science students listened intently as guest speaker Dr. Karen Mourtzikos spoke to them about how she became a doctor. A college classmate and friend of Principal Leandro, Dr. Mourtzikos practices nuclear medicine on Long Island. She volunteered her time to visit the middle school to celebrate women in the fields of science and medicine. 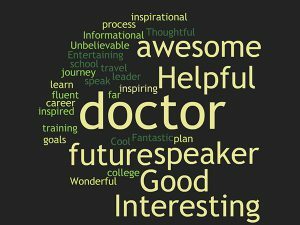 Students share what they think of nuclear medicine after Dr. Mourtzikos’ visit. Dr. Mourtzikos addressed the importance of science in our lives and how medicine relates and links to so many fields such as sports, physical therapy, and even cosmetology. She spoke about her journey in terms of applying to colleges, looking at programs, going on college visits, and then being accepted into Albany Medical College. She described the “white coat” ceremony and discussed the benefits of learning time management in college in order to carve out ample study time. Dr. Mourtzikos spoke about her various experiences at: Albany Medical College, Med Star Washington Hospital Center, University of Maryland, Johns Hopkins and NYU Langone Medical Center. As a practicing physician, she described her field of nuclear medicine and explained how nuclear medicine works in the body, along with cameras that detect energy within the body. Dr. Mourtzikos encouraged the class to dream big, study hard, and consider the science behind everything!